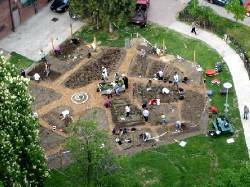 Teach-Out: Engaging our Local Food Cycle! Cascadian Edible Landscapes, whose motto is “Eat Your Yard” exists to transition our yards and blocks into edible gardens, landscapes, and neighborhood and to create food-related sovereignty for our region. They do this by helping people construct veggie gardens (raised and double dug), “food forests”/orchards, capture rain water, and through educational workshops and community supported plant starts. In January 2010, they reclaimed a 1/2 acre lot from piles of blackberry and wood, built two greenhouses, and are now producing edible annuals and perennials in two greenhouses. We will be helping to build a third greenhouse! In addition, Cascadian Edible Landscapes will be sharing their knowledge about organic veggie start production, perennial propagation, low-cost greenhouse construction, and the future of (edible) neighborhoods! CAGJ’s Food Justice Project invites our members and others to learn about and build connections with key players in the local food region through monthly visits to farms, community kitchens, and community gardens! The site visits will include hands-on work that is needed by or is appropriate to the sites, opportunities to debrief and reflect at the end of the site visit, and calls to action! Each visit will allow for carpool options and many will also feature a bike route guided by a CAGJ member. Through these visits, CAGJ hopes to facilitate a place for the voices of our local food producers to be heard and their knowledge and skills to be recognized and celebrated. **Please support our commitment to alternative transportation methods by biking, walking or taking pubic transit to this event! **Please note, space is limited, so RSVP’s are required. To sign up email Brianna at bri.beaudoin@gmail.com. We will send you directions and details upon receiving your RSVP, as well as information about what to wear and bring. All activities will be appropriate for children and we can work out disability accommodations if needed. A Car pool will be leaving the Central District at 10:30 sharp, if you are interested in car-pooling, please indicate so in your email.